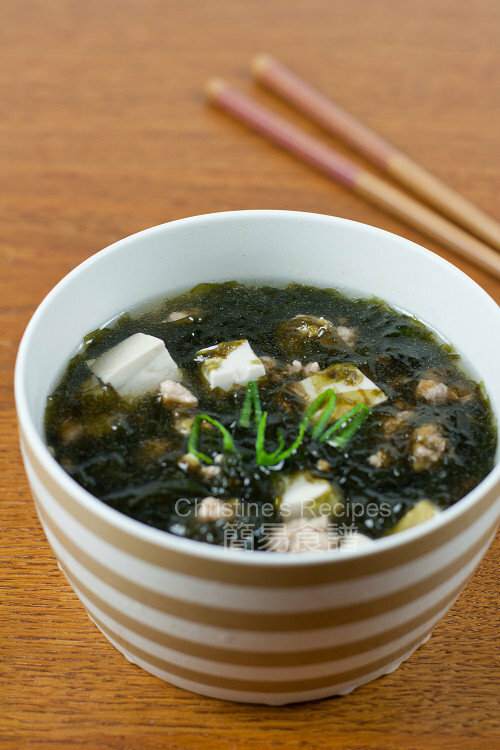 This seaweed, tofu & pork mince soup is very quick to make. It's simple, tasty and nourishing, suitable for serving all year round. Seaweed is commonly used in oriental cuisine like Japanese, Korean and Chinese. I often use the seasoned seaweed to add flavours in soup, sometimes cook soups with the unflavoured ones, that normally comes in dried sheet form. Just soak a sheet of seaweed in water until it softens. After rinsing thoroughly, it’s ready to cook with other ingredients I like. When it comes to cooking this soup, I pick the kind of seaweed sheets without any seasonings, neither that one for wrapping sushi nor for decorating dishes. The one I used is different from Nori. It often comes in a round package, sold at any Asian stores. 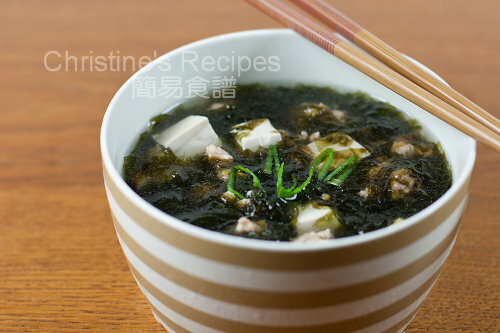 This seaweed soup can be done in 15 minutes. It’s one of my favourite quick soups, that adds an extra boost of minerals to my meals. 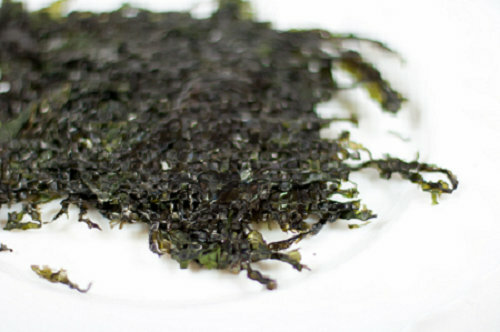 Soak seaweed in water until softened. Rinse thoroughly and drain well. Marinate pork mince with seasoning for 15 minutes. Use a large pot, pour in chicken broth and water. Bring to a boil. Add seaweed and cook for 5 minutes, add pork and cook until cooked through. Add tofu. When it boils again. Turn off the heat. Season with salt. Ladle soup in individual serving bowls. Sprinkle spring onion for garnish. Enjoy! You may use all chicken stock to increase the flavours of this soup. Or the other way round, use all water. I like use both in the proportion of 1:1. Seaweed sheets are available at Asian grocers. One of very popular summer soups! This is my favorite soup. Very simple and delicious. This is my family favourite. I cook it very often cos seaweed is very good for thyroid functions. Totally agree with you that it's very easy to cook. I always use wakame seaweed. Seaweed and pork adds lots of flavor to this soup. I also made something similar recently but tried using another veg which adds flavor too. Such a comfort food! I still have this pretty often as it really is not that hard to make and isn't that time-consuming at all. I feel like having a sip of the soup now! Very mouth-watering! Thanks for the recipe... Brings back simple memories of home cooked food.